What motivates people to launch a local online news community -- a "placeblog" and what are their challenges, their successes, the opportunities, vision and passion which accompany this work? 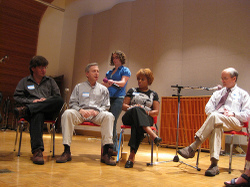 Twelve citizen-journalists -- "placebloggers" -- gathered on Friday, June 6, 2008, for a one-hour conversation at Minnesota Public Radio. Listen to the audio stream of their conversation by clicking on the carat of the bar below. Or download an MP3 podcast for offline listening. Moderated by Bill Densmore, director of the Media Giraffe Project at the University of Massachusetts Amherst.